KOLKATA: The Prince of Kolkata and Cricket Association of Bengal (CAB) president Sourav Ganguly joined the elite list of cricketers to have stands named after them when the C Block in Eden Gardens was named after him. Former India captain Kapil Dev did the honour. K Block was named after former CAB president Jagmohan Dalmiya. Blocks D and H were named after former India opener and Bengal captain Pankaj Roy, and ex-BCCI President BN Dutt, respectively. Present during the unveiling were Sunil Gavaskar, CAB joint secretary Avishek Dalmiya, former England skipper Naseer Hussain and CAB joint-secretary Subir Ganguly. It has been decided that four more stands will be named after personalities, including two war heroes whose names will be put forward by the Ministry of Defence. The other two will be named after former cricketers JC Mukherjee and AN Ghosh, and the formalities will be completed during the next international match at the venue. Mahendra Singh Dhoni was also felicitated during the ceremony which took place during the interval. 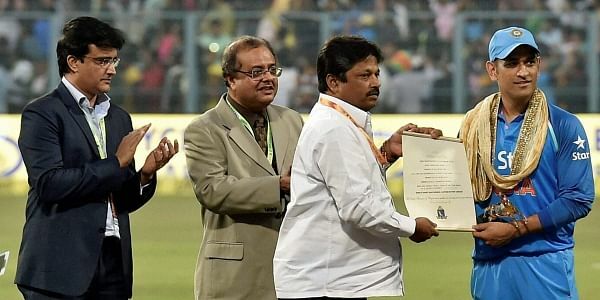 He was handed a citation and memento by India’s first World Cup-winning captain Kapil Dev, as the 66,000 present screamed his name while the giant screen showed videos of the player in action. In Lord’s style, batting legend Gavaskar rang the giant bell to signal the start of the match.